Smithsonian Affiliations creates long-term relationships with museums and other educational organizations in order to fulfill the Smithsonian’s mission, “the increase and diffusion of knowledge,” and to advance the Smithsonian’s Strategic Plan. Organizations interested in learning more about the program or in applying to become a Smithsonian Affiliate are highly encouraged to contact the Smithsonian Affiliations office before completing or submitting the application materials. To become a Smithsonian Affiliate, an organization must have a physical location where it currently provides services and/or activities for the public, and must be open to the public on a consistent and predictable schedule. Organizations under development or not yet open to the public are not eligible. Affiliates must be non-profit organizations with 501(c)(3) designations and current Form 990s on file with the IRS, or public institutions/agencies associated with state or local governments. The Affiliations staff works closely with each Affiliate to identify Smithsonian resources that can be brought to its community. Please note that any expenses related to these opportunities are the responsibility of the Affiliate. Read our FAQs for more information about becoming a Smithsonian Affiliate. Organizations interested in affiliating with the Smithsonian Institution must submit a proposal to Smithsonian Affiliations. New Affiliate applications will be accepted in Fall 2019. 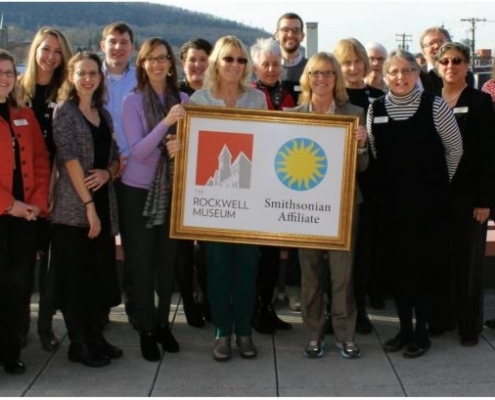 Staff at The Rockwell Museum (Corning, New York) pause for a photo-op with Smithsonian Affiliations National Outreach Manager, Jennifer Brundage, the day the Museum became an official Smithsonian Affiliate in 2015. Photo courtesy of The Rockwell Museum.